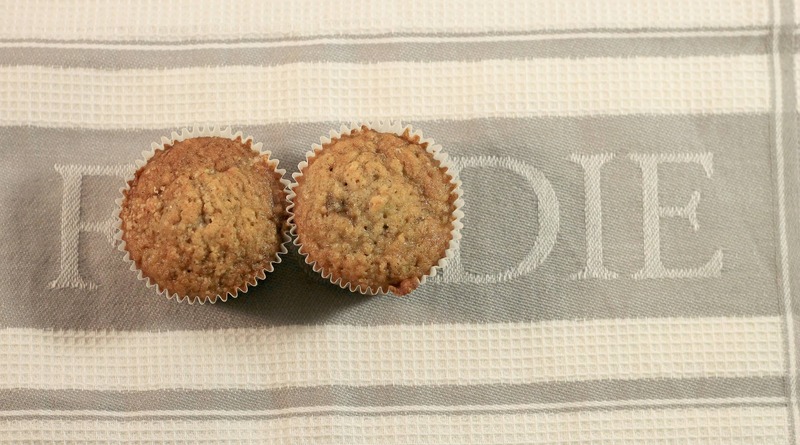 Banana Apple Muffins with Oats - THE OLIVE BLOGGER - Recipes your family will love! Well friends it is time for another Recipe Swap, who’s excited!? This month I had my good friends over at FizlDizl and I chose to make their Banana Apple Muffins…I mean who doesn’t like a good muffin on an otherwise grey Spring day? They are delicious on their own or enjoyed with a nice cup of tea. These muffins are super easy to make and are full of so much flavor! I loved the addition of the oats as well, it gave them a great texture and helped to bind the apple and banana together nicely. They remind me of traditional Oatmeal Apple Muffins but with a lovely hint of banana flavoring, win-win-win! Okay, is that not the CUTEST tea towel you have ever seen!? My sister gave them to me at Christmas and honestly I am so in love with them! Anyways…back to the muffins! The original recipe called for a boxed Banana Bread mix, which is totally awesome if you don’t want to make your own, however I chose to use an old Banana Bread recipe that I had and incorporated the rest of the ingredients for these delicious Banana Apple Muffins. I love how versatile the recipe is as well, you can really use whatever apples you have on hand (I used Gala, the original recipes uses Granny Smith) and you probably have the rest of the ingredients you need to make them tonight. The addition of some subtle spice really sets these muffins apart, they turned out AMAZING and I know that you guys will love them too! Delicious and healthy Banana Apple Muffins loaded with fruit, flavor and a hint of spice! Super easy to make, get started and create a new family favorite! Preheat oven to 350 degrees Fahrenheit, place muffin liners in muffin tray and set aside. In a mixer cream together your butter and sugar. Add in your eggs and beat thoroughly. Mix in mashed Bananas and grated Apple until combined. Sift your dry ingredients together in a medium bow (Flour, Baking Soda, Salt, Cinnamon, Nutmeg) and slowly add to your wet ingredients and mix until just combined. Add in Oats and Cranberries and stir (again until just combined, you do not want to overmix them). Fill muffin cups to 3/4 full. Bake for 17-20 minutes depending on your oven. They are done when a toothpick comes out clean, or until slightly brown on top. Bananas not ripe? That’s okay! Here is a sweet trick to get them ready for you to bake NOW! Place bananas on a try in an oven set to 300 degrees Fahrenheit and bake for 10 minutes (until peel turns brown/black) allow them to cool before squishing them out! Use a Cookie Scoop to fill your muffin cups, this will ensure they are the same size and can cook evenly. Use Muffin Liners, trust me! When making muffins, especially ones with oats, you want to line your tin so they come out nicely…otherwise you will be scraping chunks of muffin out of the muffin tray! Keep an eye on them when they are cooking, but don’t open the oven door! You want to make sure you do not overcook them, and because oven temperatures vary you want to ensure you take them out when they are done. looking for more like these banana apple muffins? Banana Apple Muffins – A delicious and healthy muffin recipe that is loaded with fruit, flavor and a hint of spice! Super easy to make muffins that use a banana bread base to create a new family favorite! Find the original recipe HERE and be sure to check out FizlDizl for more than just your recipes! They have an amazing Shop Page where sales from their beautiful handcrafted products go towards helping those less fortunate. I seriously LOVE these guys! Kale and Broccoli Salad- New Salad Favorite! Love this! Thank you for sharing this recipe with your readers. It is one of our favorites and the kids really love having something easy to grab for breakfast before school too! They are delicious, we have gone through half of them already, the rest went into the freezer so we can have them on hand when we want them! The weather just turned cold again and these muffins would be a perfect morning snack – especially fresh out of the oven – yum! Brrr yes I know, it is snowing where I am today! Nothing better than the smell of fresh baked muffins on a cold day! Oh lordy! There look SO good! I can’t wait to make them. These look amazing! I would totally scarf down some right now! It is hard to stop with just one!!!! These look so delicious… and I think my toddlers will like them!! Thanks for the recipe!! I hope they do!!! They are so yummy! Yum! These look great! And I bet they freeze well also! I put half in the freezer and they come out just fine, I love big batch recipes to have for grab-n-go mornings! Looks amazing! I wonder if they’d turn out ok if I swapped flour for almond flour? I am sure they would be just as delicious! Let me know if you try it out so I can add a variation on the recipe as well!! Yum! These sound delicious and not too fiddly! Will have to file this one away for my next big cook up! They are super easy to make, and really don’t take long at all so you could have them baking when unexpected company pops in! My son would go gaga over these muffins! He absolutely loves bananas and apples! I am going to have to make these for him! So cute!! It is such a classic flavor combination, they are so easy to love! Oh goodness one of our weakness lol. Just over banana muffins. Thank you for sharing this awesome recipe. These sound delicious! I’ve gotta give them a try!